Every week we send out new Research Briefings to our members. So what is a Research Briefing and what does it contain? There are over 78,000 new academic research papers published around the world every month (so we have a few to choose from!). The Oxford Review is the only service in the world that scans every single piece of research as it is published (we often have access to the papers even before the research is actually published) to find the very latest research and thinking about organisational and human development, management practice and more. We then use current practitioners and consultants to trawl through all this to find only the most relevant, practical and useful research for our members. So every week we get best bits from the research world and turn them in practical and useful briefings for our members. 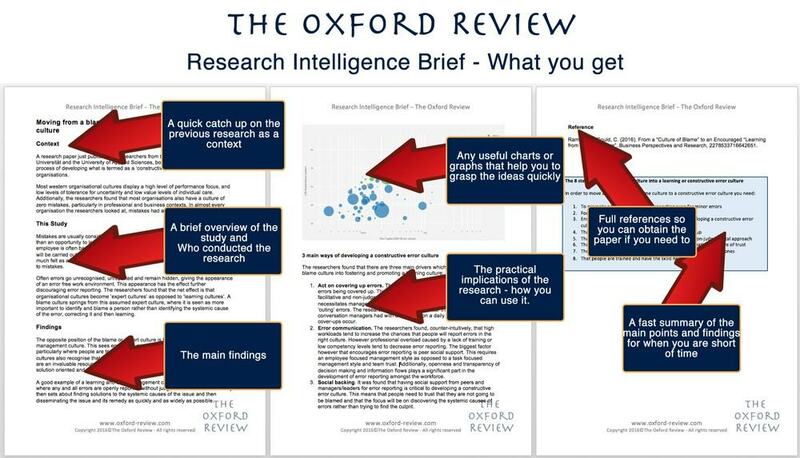 The aim of the Research Intelligence Brief is to brief you on the latest practical and useful research as it is published (not months or years later) so that you are kept completely up-to-date. Actually you will be kept more up-to-date than the students on many courses in the world’s leading universities and institutions without having to trawl through a pile of boring, unintelligible and irrelevant papers. These courses are often prepared months if not years in advance. You get the research as it is published. In fact, quite a number of our members are academics, professors and lecturers from these very universities. What is in a Research Briefing? And all in a way that makes it easy to understand, quick to grasp and straightforward to impliment. Practitioners around the world find the Research Intelligence Briefs quickly become the backbone of their daily working life that give them their edge and credibility. Why don’t you try us out for free?